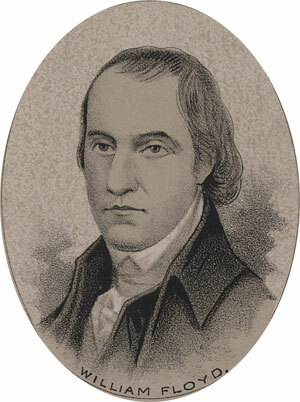 Work: Soldier; Member of Continental Congress of 1774-76; Member of Congress, 1789-91; State Senator, New York, 1808. William Floyd was born on Long Island on December 17, 1734. His family had emigrated to America in 1654 and by the time of his birth were well established and wealthy. Though he might have received the best education, his father died when he was in his teens, and William was required to take over the operations of the family farm. He was a member of the Suffolk County Militia in the early conflict with Britain. He attained the rank of major general, though at this late date he spent most of his time in the Continental Congress. In 1774 he was chosen to represent New York in the first Continental Congress. He served there through 1776, while his property was destroyed in the Revolutionary War. He acquired land on the banks of the Mohawk river after the war though it would be a few more years till he would retire there. In 1789 he was elected to congress under the new constitution. He served there, acting several times as a presidential elector, until he returned to his native state in 1791. He was called to the service of his state as a Senator in 1803. After serving his term he retired to his true passion, farming. He died in 1821.